We were in the Lakes again last w/end... visiting Our Friends From The North. One FFTN ( above) was exhibiting her super collage pieces...this is work she's amassed over several years, keeping much of it locked away high in her attic....to be enjoyed by the odd passing mouse or a curious spider or two.....or even perhaps by a nosy visitor relegated to the attic to sleep.........until last weekend, that is..... when folk enjoyed our friend's work as part of Coniston Arts and Crafts Society's Annual Exhibition. The Institute was built in the 19th century.....primarily for the development of the " mechanical" arts. .....and in particular woodcarving and lace making.And on Saturday these traditions were alive and well and thriving in Lakeland...as was stone carving, wood bending, pottery, book binding...and more. On this sultry night in a small theatre, we listened to Clare's readings and watched her glorious film...then we drank wine, nibbled nibbles.... and scoffed cake ( rumoured to be laced with brandy??? ) and all had a very good time indeed. Clare has strong Welsh connections.... and her lyrical book tells how a band of Welsh people colonised Patagonia in 1865. The story tells of survival and sacrifice, of loss and love....and about the making of new lives as old ones fade away. Clare's writing is always superb...and I look forward to settling down with this ASAP. Here's me at Bolesworth Castle last week. I was lucky enough to be included in "Zoo", the anthology of 23 shortlisted short stories from The High Sheriff's Cheshire Prize for Literature, 2009. 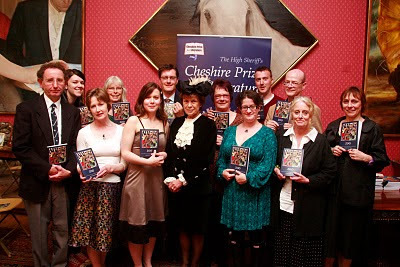 Each of us was presented with a book by the Sheriff, Diana Barbour ( in centre of snap) who welcomed us into her fabulous castle. This is, in fact, a gorgeous home...a mix of lovely old family pieces, fabrics, carpets....set comfortably with stunning contemporary paintings...and the gardens too were at their lush June best.....( although we had no chance to explore) .... but the rhododendrons ( purple, violet, lavendar ones) fair took my breath away!! This visit was a treat. BUT Here are some further thoughts: It appears that the painting was sold by Lord Andrew Lloyd-Webber's Foundation. They bought it in '95 and exhibited it in both National Gallery/Royal Academy. The Foundation now intends to use the money to support the training of talented young stars in musical theatre.
" King Richard's Treasure At Beeston..."
And here's mine....based on the Legend of King Richard's treasure. This legend has it that in 1399, King Richard 2nd hid his treasure in passageways leading off the well at Beeston Castle. This castle, now in ruins, dates from 1220...and was set in the most splendid of sites...on a high and solitary hill....with vast vistas of the Cheshire Plain.... and well beyond it. "On a day like this, we watched buzzards soar…and waver in circles above us. Years ago. We heard echoing calls of ravens, deep croaking from the tallest of trees. And we climbed the red sandstone cliff to stare across the Cheshire Plain. And our gaze was long and lavish, spreading wide over eight British counties. And while you looked for Snowdon, I found Cathedrals in Liverpool. And when you watched pheasants swoop, I smelt the sea, heard church bells from Chester (St Mary’s Within Walls, St Mary’s Without)… as they pealed across fields, sounds of delight, music across a Plain. We were so sure, weren’t we! You swore that the flashing of sun…through birch and rowan, through bracken and oak…was the light on that sign at the Odeon…as it flickered its glamorous wares…. So I laughed and my laughter rivalled the cackling of crows. And I laughed again…when you said that the breeze in the trees was the Liverpool crowd…men dressed in red (seething with pride) victorious lions at Anfield. So we stopped and we listened. We stood on this hill by a castle. Farmers worked in fields and lovers lay in hedgerows and the ruins of the castle were smug with their private personal secrets. And at dusk when woodpeckers called, we searched for King Richard’s Treasure. Then over years, Two Towers fell. A Wall came down. An old dark man won freedom. A Princess died. A Queen survived. And our babies grew. And had lives of their own. And the world moved on. But now we stand on this hill again, watch buzzard soar; hear croak of ravens by a castle still gloating with secrets. And I smell sea again … and you hear those rippling crowds at Anfield. And I say to you: “We’ve found King Richard’s Treasure….” "
" Supper With The Reckless Sleepers..."
Recently I met The Reckless Sleepers... an Anglo Belgian performance company, formed in 1988. Their name is taken from Rene Magritte's painting... the reckless sleeper....painted in 1928...and the company delight in performing provocative drama... in surreally wonderful places.
" A Highly Desirable Doll's House..."
BUT firstly in May, Ibsen's " The Doll's House" ran at the Little Theatre ( Chester Theatre Club)...this was a very fine production, with a fine cast directed by Delys Rostron...including particularly starring roles from Sophie Lund ( who is certainly going places!) and the excellent and versatile Simon Price. And of course, there was Zoe Lambrakis....( just 18, whose richly resonant tones will be long remembered at the Little Theatre)...who portrayed middle aged widow Kristine with great aplomb. SEE http://www.chestertheatreclub.co.uk/ for booking details.